Samsung may be looking toward selling unused Galaxy Note 7 components inside refurbished phones, replacing the battery tech inside to ensure its repurposed devices won't catch fire. South Korea site Hankyung says the company is looking to minimize the profit damage of the Note 7 battery scandal and is conscious of the environmental impact of not using the Galaxy Note 7 tech it still has in stock. According to the report, Samsung will reduce the battery capacity in the phone and replace it with new technology to ensure it’s safe to use in the refurbished devices. The Note 7 originally had a 3,500mAh cell, but this refurbished device will have a 3,000mAh to 3,200mAh battery inside instead. The repackaged devices will then be sold in emerging markets such as India and Vietnam. Whether the report is accurate or not is currently unclear (there's no specific source cited by the article), but it does sound like a way to use the leftover tech from the Galaxy Note 7 problem. It's unlikely Samsung will be selling the phone under the Galaxy Note 7 moniker though – the report suggests the company will make new cases for the phones and just reuse the core components. Yesterday news broke that Samsung's reputation – measured by Harris Poll research – in the US has fallen 42 positions from seventh place to 49 after the Note 7 scandal. Before the Galaxy Note 7 started to catch fire we gave it a great score of four and a half stars out of five, so it’d be great to see this technology used again in other devices. 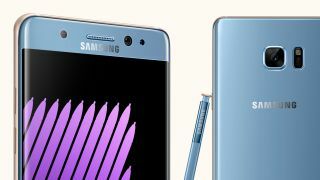 We’ve spoken to Samsung to get an answer on whether the Note 7 will be making a comeback, and will update this article if and when we receive a response.